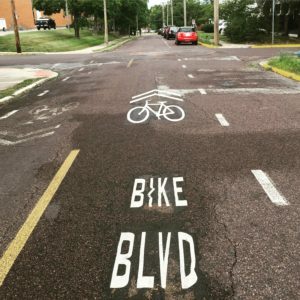 How do you travel on a Bike Boulevard? You may have noticed construction on the west end of the Business Loop, near the intersection of Madison and Parkade. What you’re seeing is the final stage of the new MKT-Parkade Bike Boulevard. 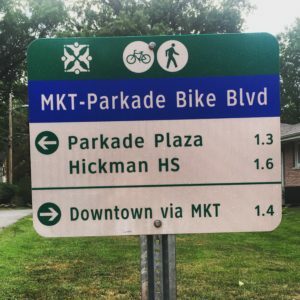 What is a bike boulevard? Good question! Bicycle boulevards are streets with low motorized traffic volumes and speeds, designated and designed to give bicycles travel priority. Bicycle boulevards use signs, pavement markings, and speed and volume management measures to discourage through trips by motor vehicles and create safe, convenient bicycle crossings of busy arterial streets. 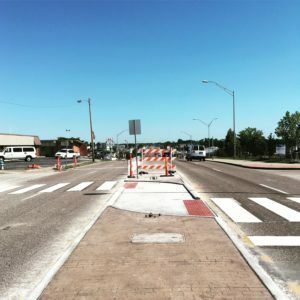 You may already be familiar with the bike boulevard that runs from the downtown area to Stephens Lake Park, going through the Stephens College campus. The boulevard provides a safe travel route for commuters, students, and families as they attempt to negotiate the narrow, crowded streets on their bikes. Residential car traffic can still travel along the street and people can still park by the curb, but the pavement markings, signage, and other infrastructure changes make it a more bike-friendly route than other streets. In the photo above, you can see that the dashed line indicates a parking lane adjacent to the right curb while the biking lanes are striped just like normal driving lanes, with a dashed yellow line separating the two lanes of oncoming traffic. The “bike blvd” markings alert everyone to the fact that more bikes will be traveling along this road and to drive with caution. Where do cars drive? Simple, right down the bike lanes. Of course, drivers will have to politely maneuver around oncoming traffic—fairly common anyway on such a narrow street. It’s not a good route for through traffic because there will be bikes using the street but in the case of the Madison-Parkade Bike Boulevard, we recommend cars use Garth or West Blvd. 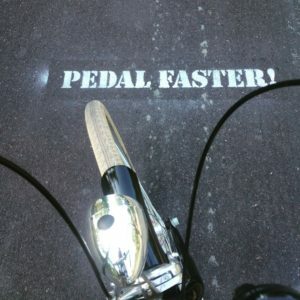 as a quicker, easier route for cars. The new project creates a north to south bike boulevard that will connect Parkade Boulevard to the MKT Nature and Fitness Trail on Lathrop Road. The project also includes a spur down East Forest Avenue to Hickman High School, adding some needed safety measures for students crossing Providence. The new bike boulevard will have numerous benefits, the most important of which being the increased safety for cyclists. Studies have found that car/bike collisions are two to eight times lower on bike boulevards than on regular streets, making it a family-friendly option for getting to a school or park. Anyone who has tried to cross five lanes of Business Loop traffic at Parkade or watched Hickman students play frogger across Providence will realize that the new medians, painted crossings, and signage won’t just benefit cyclists, they’ll help pedestrians as well. The city is currently reconstructing sections of sidewalk at Parkade and Madison, adding curb cuts and sorely needed crosswalks. We’re looking forward to the new bike and pedestrian-friendly improvements here on the Business Loop and now that we have a safe route across town, we hope to see you pedaling our way soon. This article originally appeared in the Columbia Business Times.